Elecon engineering has expertise in designing and manufacturing high speed, high power gearboxes. The TA TURBO Gear unit is a single stage step-up or reduction Gear unit with horizontally offset. 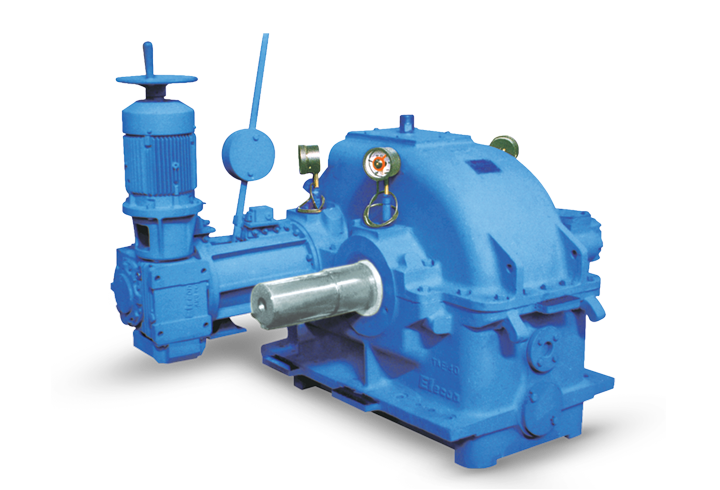 It is designed as a double helical Gear unit. High Gearing quality and tooth flank modification adapted to actual tooth load allow for extremely high pitch line velocity. Double helical Gear units are simple to design & manufacture and compact. Double helical gearboxes are more efficient than single helical gear boxes. This Gear unit is used in high speed plants such as turbo generators, turbo Compressor, Boiler feed pump application etc. The TAD turbo Gear unit is a single stage step-up or reduction gearbox with horizontally offset. It is designed as a single helical gearunit.to the thrust collar technique. The tooth thrust resulting from helical teeth is being compensated through thrust collar.